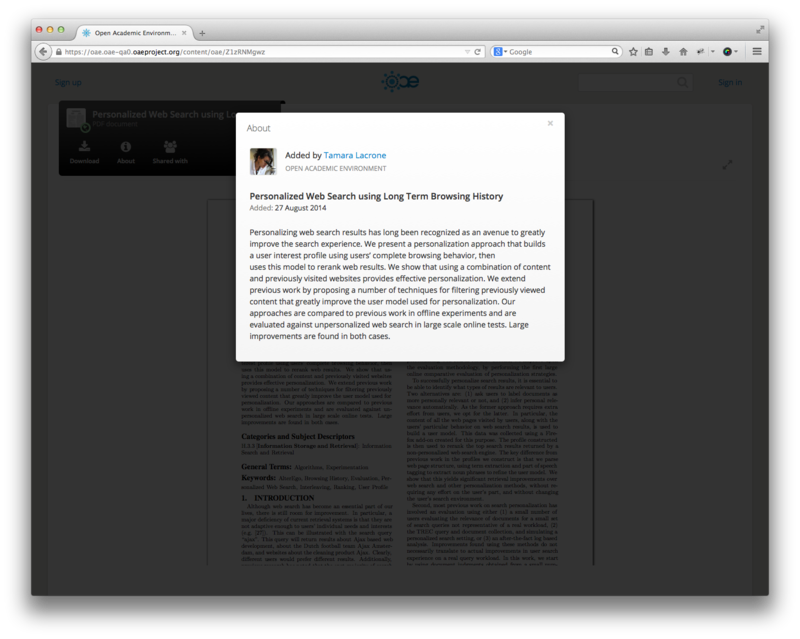 Back to posts Apereo OAE Griffin is now available! 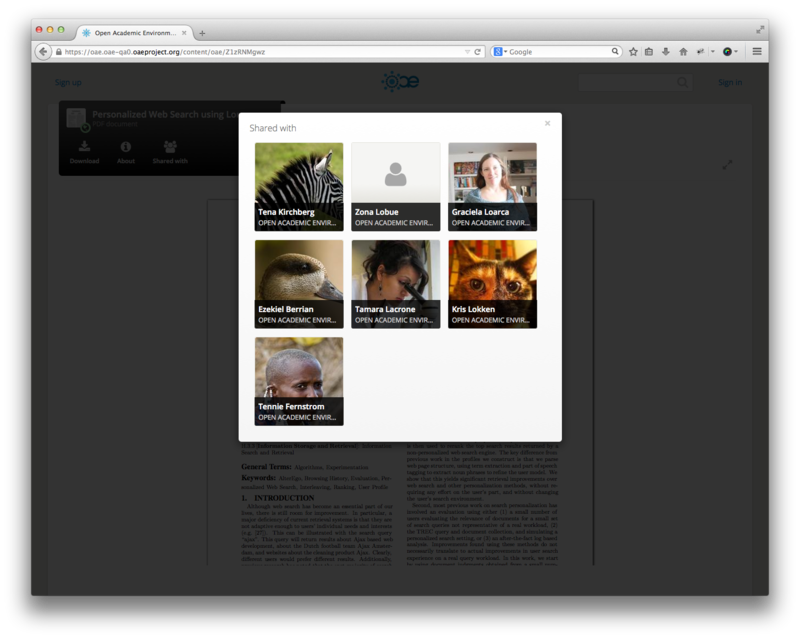 Apereo OAE Griffin is now available! The Apereo Open Academic Environment (OAE) project team is excited to announce the next major release of the Apereo Open Academic Environment; OAE Griffin or OAE 8. OAE Griffin brings a complete overhaul of the collaborative document experience, metadata widgets, full interactive REST API documentation and improved Office document previews. Next to that, OAE Griffin also introduces a wide range of incremental usability improvements, technical advances and bug fixes. 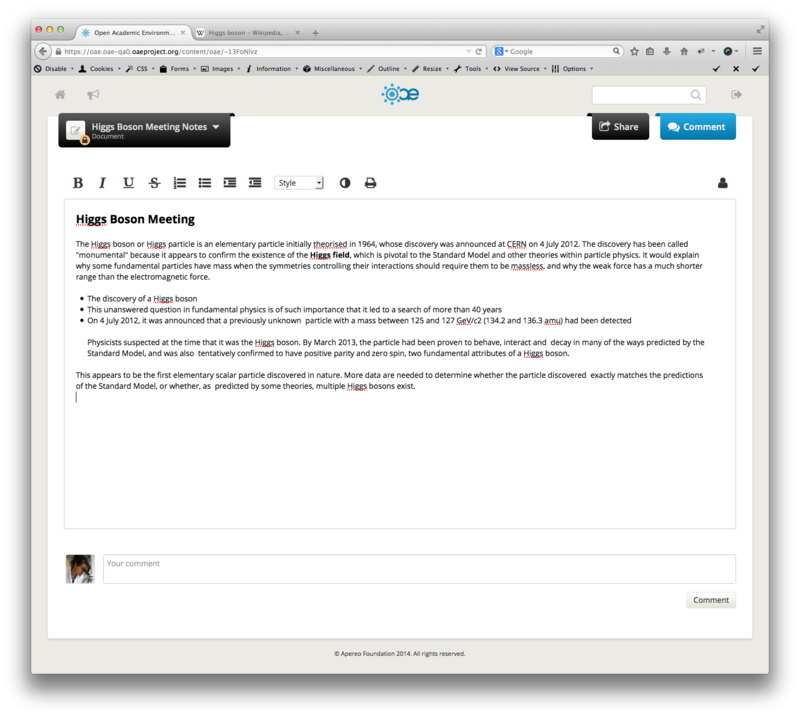 The collaborative document experience in OAE Griffin has been completely overhauled. Whilst OAE's collaborative note taking capabilities have consistently been identified as very useful during usability testing, the actual Etherpad editor user experience has always tested poorly and never felt like an inherent part of the OAE platform. Therefore, OAE Griffin introduces a fully skinned and customised collaborative document editor. The Etherpad editor has been skinned to make it fit seamlessly into the overall OAE interface and a number of under-utilised features have been removed. The editor and toolbar now also behave a lot better on mobile devices. All of this creates a much cleaner, more integrated and easier to use collaborative document experience. At the same time, the activities and notifications generated by collaborative documents have also been fine-tuned. OAE Griffin now detects which people have made a change and will generate accurate activities, providing a much better idea of what's been happening inside of a document. It is now possible to see the metadata for all content items, discussions and groups. This includes the full title of the item, the description, who created it and when it was created. For content items and discussions, it is also possible to see the full list of managers and people and groups it's shared with. All of this will provide a lot more context to an item, for example when discovering an interesting content item or when wondering who's involved in a discussion. At the same time, the long-awaited download button has been provided for all content items, ensuring that the original file can easily be downloaded. OAE Griffin introduces a REST API documentation framework and all of the OAE REST APIs have been fully documented. 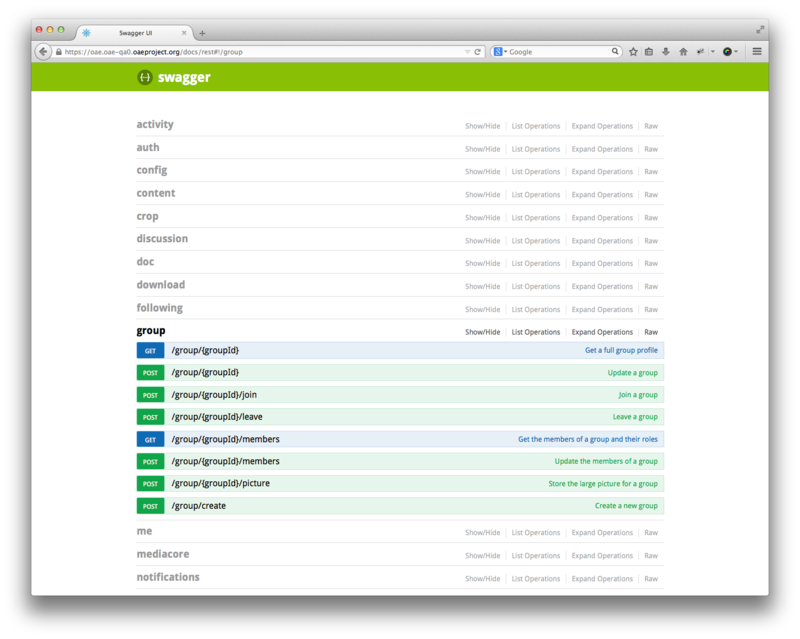 This work is based on a REST API documentation specification called Swagger, and offers a nice interactive UI where the documentation can be viewed and all of the REST endpoints can be tried. This documentation is available on every OAE tenant and sits alongside the internal API documentation. All of this should provide sufficient information and documentation for widget development and integration with OAE. The OAE preview processor has been upgraded from LibreOffice 3.5 to LibreOffice 4.3. This brings tremendous improvements to the content previews that are generated for Office files (Word, Excel and PowerPoint). Especially the display of shapes, pictures and tables has been much improved, whilst some additional font support has been added as well. The email notifications have been tweaked to ensure that emails sent out by OAE are as relevant as possible. At the same time, a number of visual improvements have been made to those emails to ensure that they look good on all devices. Browsers have started introducing a set of new new cross-protocol embedding restrictions, which were causing some embedded links to not show correctly in the content profile. Therefore, OAE Griffin puts a number of measures in place that improve link embedding is and provide a fallback when a link can not be embedded. It is now possible to pick up and use SAML attributes released by a CAS authentication server. This allows for a user's profile metadata to be available immediately after signing into OAE for the first time, without having to pre-provision the account. The icons used in OAE Griffin have been upgraded from FontAwesome 3 to FontAwesome 4.3, allowing for a wider variety of icons to be used in widget development. OAE Griffin has been upgraded from Apache Cassandra 1.2.15 to Apache Cassandra 2.0.8, bringing a range of performance improvements, as well as the possibility of setting up simple database transactions. OAE Griffin can be tried out on the project's QA server at http://oae.oae-qa0.oaeproject.org. It is worth noting that this server is actively used for testing and will be wiped and redeployed every night. Documentation on how to install the system can be found at https://github.com/oaeproject/Hilary/blob/8.0.0/README.md. Instruction on how to upgrade an OAE installation from version 7 to version 8 can be found at https://github.com/oaeproject/Hilary/wiki/OAE-Upgrade-Guide.